We heard a lot of buzz about Zaarly at SXSW. Through our partnership with Tony Hsieh’s Delivering Happiness movement, we interviewed a lot of thought leaders, creatives and innovators. One of the questions we asked was what app or service have you found at SXSW to be most interesting, and we heard Zaarly quite a few times. We’re betting that if you haven’t heard of Zaarly yet, it’s very likely you will, and soon. Say you want a seat for an event that is sold out – you post it to Zaarly to see if someone who has a ticket will sell it to you. You need your driveway shoveled before work – and you don’t want to do it yourself. Put a request on Zaarly with the amount you’re willing to pay. Can’t get a reservation to a hot restaurant? “Zaarly it” that night and see if someone will ‘sell’ you their upcoming reservation. Zaarly is the place where everything has a price. How does it work? It is a mobile application that operates using Twitter, Twilio and MongoDB to connect users in the same proximity. For buyers, a request is made to the service and if it is accepted, an anonymous connection is made to that person willing to ‘sell’. When both sides agree, consider it a done deal. For sellers, there is cash to be made from people in their locality willing to put a price on their request. Co-founded by Fishback, Eric Koester and Ian Hunter, this seasoned team is moving quickly. (All have successful ventures under their belts.) Operating with an initial $1 million investment provided by all-star funders including LA Startup panelist Ashton Kutcher, Fishback says that “rock star” developers have been hired with the goal to launch Zaarly in multiple cities in the next 90 days. How will Zaarly make money, you ask? The platform will operate on a revenue model where a transaction fee will be assessed when people use any of the integrated mobile payment options. If you use cash with Zaarly, it’s free. Tech Cocktail (TC): You left the Kauffman Foundation, which you said was amazing, for this opportunity. Where do you see this going? Bo Fishback (BF): I really do think that the Kauffman Foundation is one of the most amazing places on the planet, and my particular role there was quite possibly one of the greatest jobs imaginable. [Until recently Fishback was the Vice President of Entrepreneurship at the Kansas City, MO-based foundation, as well as President of Kauffman Labs, the foundation’s entrepreneurship program.] It was fast paced, intellectually interesting, full of amazingly brilliant people and fundamentally important work that I loved. That said, I’ve probably seen close to 1,000 startups and founding teams in the last 5 years but I haven’t seen anything up close that I think has the potential of Zaarly. Where do I see it going? Honestly, I think it depends entirely on our team’s execution and ability to iterate quickly and capture mindshare. If we’re successful, I think Zaarly could be a enormous company. I hesitate to say how enormous, but definitely something very special. TC: Did you go to the LA Startup Weekend with this idea? If not, how was it conceived? BF: I didn’t really even go to Startup Weekend planning on pitching an idea – I only even went to this particular Startup Weekend because it was Eric Koester’s (one of my co-founders) birthday and he asked if I’d come down to LA to celebrate. I decided last minute on Friday night that instead of just helping other teams, it would be fun to pitch an idea and have the full startup weekend experience. What I pitched was actually not exactly what we ended up creating….I think they are related but the most compelling pieces of Zaarly were really invented after the initial pitch. I (along with lots of other people) had previously thought that there was an opportunity for location-based markets, but the unique things about what Zaarly is turning into were really hatched starting at 2 am on Friday night in a conversation with Eric, and we’ve been busy iterating and improving on some of the those core ideas since. TC: Did you know the team prior to working on Zaarly? 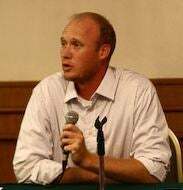 BF: I knew one of my co-founders, Eric Koester. Both Eric and I met Ian Hunter, our other co-founder and CTO, for the first time on Friday night after I pitched the original idea. We asked the people at Co-Loft (the host of SWLA) who the most talented developer in the building was and they pointed us to Ian, and we were lucky enough to have him join our team. We’ve recently hired a few super talented people to help us drive Zaarly going forward. Our first hire was Matt Constantine, a developer who we worked with leading up to SXSW. We’ve also added a few other hires and engaged a handful of super-talented contractors and other partners. TC: How did the name come about? BF: The name Zaarly was born on Friday at Startup Weekend in big group discussion. One of the great things about SW is that you can get a lot of really sharp folks working extremely quickly on super focused tasks… naming Zaarly was one of the outputs of this exercise. It’s a derivation of the word “bazaar” — as in a Moroccan bazaar where everything has a price, everything is for sale, and anyone and everyone are engaged in real-time commerce. We wanted it to be something that could be used a verb, as in “to Zaarly it”. Lastly, the url was available. TC: How did the idea get the support of Ashton and Demi? BF: Ashton and Demi showed up to Startup Weekend just to check it out and see what people were working on. Ashton ended up being a judge on Sunday evening and the Zaarly message seemed to resonate with both he and Demi. TC: What kind of feedback have you been getting? BF: It’s been pretty incredible. The idea of creating a proximity based, real-time, buyer powered network seems to resonate extremely well with almost everyone we’ve talked to. Our experiments at SXSW showed us that this can really work, and work fast. 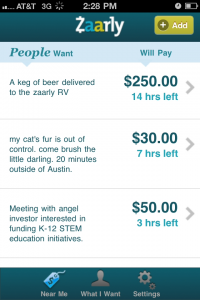 In the first 24 hours in Austin, Texas we saw $10,000 in transactions take place on Zaarly. What’s really amazing about that is that these are transactions that were all newly created economic value… they would not have happened if not for Zaarly being there. Outside of Austin we’ve seen a huge demand for Zaarly to get to more cities faster. We’re planning on a much larger scale rollout in the next 90 days and hope to be in as many cities as possible, as soon as possible. We’ve received thousands of requests from all around the world and are working as fast as we can to get Zaarly in the hands of the buyers who want to use it and the sellers who want to cash in on those wants.